Our Best Selling Room Divider is designed with quality and practicality in mind making it ideal for most customers’ needs. Recommended for classrooms, libraries, hallways and common areas. 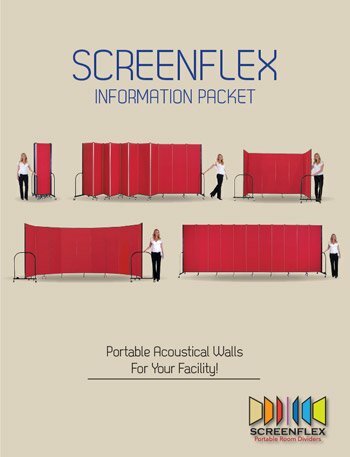 When in doubt, get the Standard Screenflex Room Divider. For situations where a room divider is needed at the same location constantly, we offer a WALLmount Room Divider. WALLmount dividers attach to a wall at one end and open out into the room for privacy. The walls are available with a left or right mounting bracket and store snug against the wall when not in use. Light Duty Dividers are functional and affordable. With no end frame, this divider is best used in light use scenarios. This portable partition offers the best in room dividing solutions. One side hosts a tackable black fabric surface to display artwork, flyers or instructional material. While the opposite side is covered with a writable bright white surface. The white surface is dry erase compatible. Display students’ artwork on one of the 3 or 6 winged Screenflex Display Towers. Tack, pin or staple items to the durable fabric-covered panels. Healthflex Room Dividers help you provide privacy in the nurse’s station, during student physicals, or when administering immunization. Their sleek profile allows them to divide smaller spaces and the ability to move with ease. Healthflex Dividers are factory treated with an antimicrobial coating to prevent the spread of germs. Also available in a vinyl surface which is easy to clean. Screenflex sound absorbing panels hang horizontally or vertically. Ideal for use above lockers to display students’ work, in lunchrooms to dampen sound and computer labs for project planning. Easy to install! Perfect when division with vision is needed. The crystal clear 3/16″ OPTIX® acrylic clear whiteboard is framed by a sturdy black anodized aluminum frame. These room dividers are built to last. With enhanced features, the Heavy Duty Divider can withstand more rigors environments. Comply with special education standards with Screenflex Study Carrels. These privacy screens attach to the wall and extend into the room to provide a semi-enclosed environment for a private learning and testing space. When the full room is needed place the tackable panels flat against the wall to use as a bulletin board. Screenflex Fire Resistant Screens are ideal for industrial education classes. The Fire Resistant Screens uses fire barrier fabric to obtain an ASTM-E84 CLASS 1 (UL 723, UBC 8-1, NFPA 255) fire rating. The Welding Screens provide a safe welding environment.